It was second weekend of January and we were ready to continue our trek along the coastline of Karnataka. 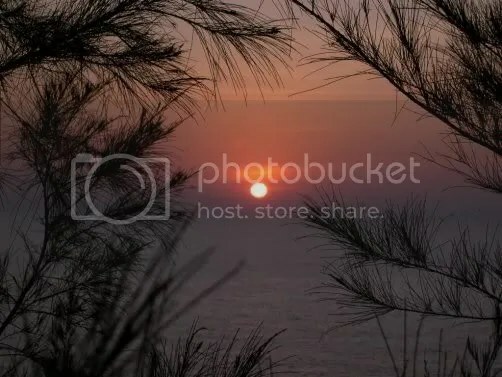 After having the done the Ankola-Gokarna-Honnavar stretch, this time the plan was to continue from Honnavar and reach Bhatkal via Murudeshwar. 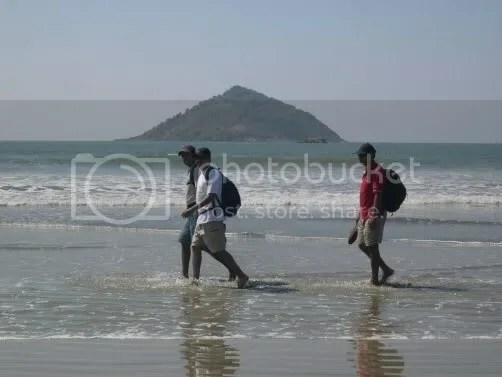 Not much planning and preparations were needed for this trek as we had decided for a night halt at Murudeshwar, which is a popular tourist center. 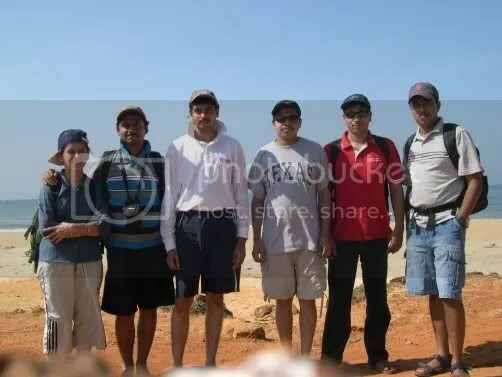 The group started with Naren and me, but quickly we were joined by Veena, Ananth, Prasanna and Kulki. Going out of Bangalore on long weekends is turning out to be real tough these days with all kinds of transportation running full. Fortunately we could reserve our return tickets from Bhatkal, thanks to Naren’s contacts in Bhatkal. Our bus started 1 hour late due to heavy traffic around Majestic. Accordingly we reached Honnavar an hour late at 8.45AM. 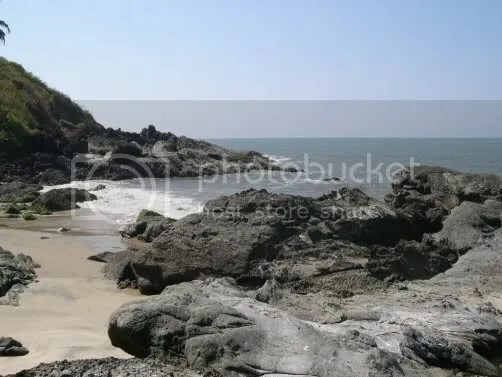 Honnavar surroundings had become familiar to us, thanks to our last beach trek. Without wasting much time, we quickly checked into Hotel Sanman to finish our morning ablutions. The breakfast at Kamat Hotel was followed by sweet tender coconut. We even packed lunch from Kamat. We had ended our last trek at a village called Karki near Honnavar. River Sharavati joins the Arabian sea after Karki village. Hence we wanted to start at a point after this river mouth. Autos were hired to reach a village/beach called Kasarkod, which is right after the long bridge across Sharavati. It was 11AM by the time we touched the Kasarkod beach. We were expecting mild temperatures in January, but that was not to be, the thermometer was already showing 30. We could see an island to the right which we had used as landmark to reach Karki last time. Now we had to walk towards left away from that island. 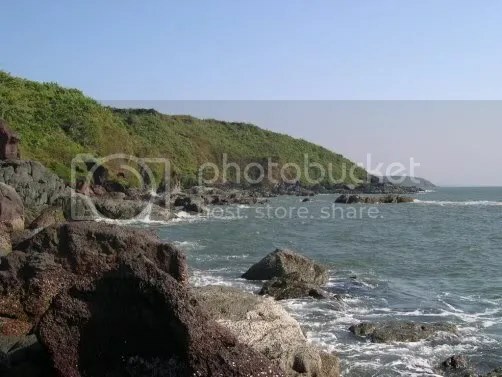 The initial trail is a 5km continuous beach stretch which ends in a hill near Apasarakonda village. We covered this uneventful stretch in about an hour. A fisherman advised us not to cross the hill from the rocky beach end, but rather climb up the hill. We took his word and did try to follow the trail, but had to retreat as we could no longer trace the trail after sometime. Returning back to the beach, we decided to take the rocky path to cross the hill. Though walking on rocks right adjacent to the sea was fun, the end was never in sight. We walked almost an hour and a half on the rocks. Rocks were literally thorny at many places. At many places, crossing the sharp edged rocks needed lots of attention. At around 1.45PM, there was some respite from the rocks when we entered a tiny (around 10m long) beach stretch. We needed this to literally cool off our heels. Crossing the next rocky stretch turned out to be a bit tricky. When it appeared that we can’t cross this without taking some amount of risk, we abandoned the idea and tried to cross over the hill by climbing it. But when we quickly realized that climbing is not feasible, we turned back and reached the tiny beach stretch again. We had two options, either to retrace our steps back until Apsarakonda and enter the village there or try to climb up through the thick vegetation. We choose the latter and Naren led us from the front by clearingall the vegetation and making a path for us to follow. Though it started well, he could do that for around 30min before he got exhausted and I took over. The vegetation was very dense and it was getting difficult to force our way up thro’ such dense bushes. I could manage for another 5min and we were still halfway from the top of the hill. It was 2PM in the afternoon and with sun beating down hard, Naren and I lost all of our energies and had to resort to glucose supplement. That’s when Naren and I decided to head downwards. Though others following us wanted to try a bit more, we were absolutely in no condition to do any further climb. We took half an hour to descend and reach the tiny beach stretch. What was a tiny beach stretch 2 hours back wasn’t there anymore as tide had changed and the sea had encroached further till the rocks. Without an inch of shade anywhere, some of us had to finish the packed lunch in the open sun. At around 3PM we started back and reached the Apsarakonda beach by 4PM and spent around 30min in the beach. Though the current was strong, we had some nice relaxing time. We needed this after such a tiresome day at work. There is a freshwater source at Apasarakonda. By walking beside it, we reached a temple affiliated to Shringeri Sharada Mutt. There is ample space in the temple for night stay and food is also available on request here. But since they didn’t have bedding arrangements with them and neither we were carrying any; we couldn’t make use of this excellent opportunity to spend the night in that serene atmosphere. We did a kilometer of walk thro’ the lanes of Apsarakonda village before reaching NH17 at 6.30PM and boarded a tempo to Murudeshwar. 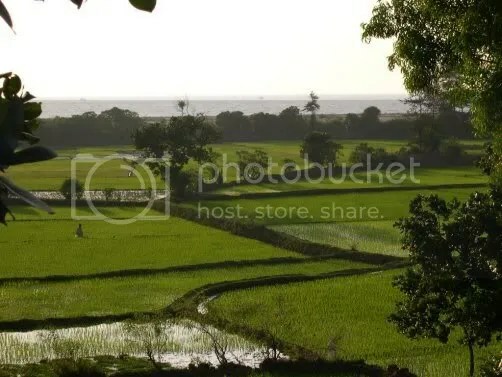 If we had followed the trail which goes over the hills as mentioned by the fisherman at Apsarakonda beach, we should have ended up in Manki village which is around 4km from Apsarakonda village by road. 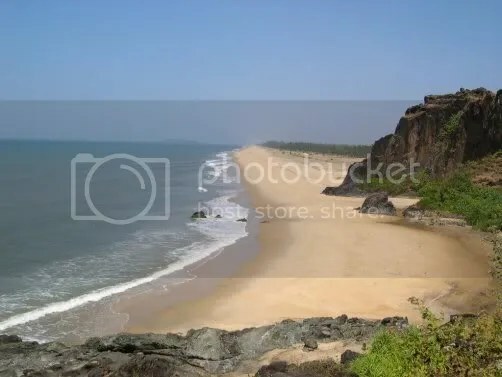 One should ideally start this beach trek from Manki and not at Honnavar/Kasarkod. From Manki it is around 12km to Murudeshwar, and from what we heard from villagers, is free of any major rocky stretches. So ideally one should start from Manki in this stretch instead of Kasarkod like what we did. It was 7PM when we reached Murudeshwar. Most hotel rooms in Murudeshwar are exorbitantly expensive and we found one hotel charging as much as Rs 1200/- for a double room! We finally managed to find a decent looking midrange hotel. Most of us didn’t have energy to go through the routine of wash and bath; dinner was foremost in our minds. 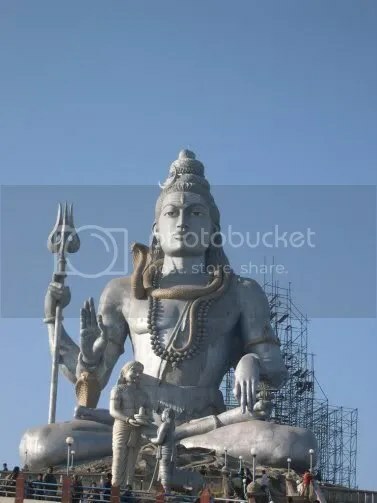 After a quick visit to the Shiva statue we settled for the night in Murudeshwar. Next day started early with breakfast and a visit to the temple. There is an ancient Shiva temple here. We started the 2nd day’s trek at around 9AM. 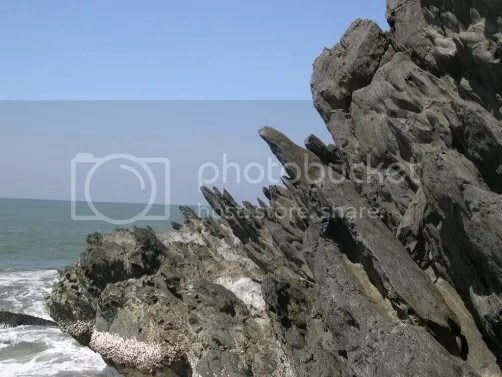 The route from Murudeshwar to Bhatkal is a continuous beach stretch of around 12km. At around 2km from Murudeshwar is Kaikini village and at around 4km is the Bengre village. At 11AM we reached Alavekodi village which is around 8km from Murudeshwar. At Alavekodi, we left the beach and entered the village. We entered a house to replenish our water sources. The curious inmates of the house were more than willing to be our hosts. We had entered the village to visit the Durgaparameshwari temple. The temple is big and beautiful. The temple is on the banks of Venkatappa river where the river joins the sea. We had to use the boat service to reach the other side and join the beach again. From here we walked for around an hour to reach Herthar village where we decided to end the trek. We had to walk around half a km before boarding an Auto to Bhatkal. We had reached Bhatkal at 1.30PM. At Bhatkal we had lunch in Vaibhav hotel which is probably the only decent vegetarian hotel there. We hired a room in Vaibhav lodge to spend the evening. While Kulki and Prasanna returned back to Honnavar from where they had return tickets to Bangalore, rest of us decided to check out the Bhatkal lighthouse. We had to hire an Auto to reach the lighthouse. We could spot police vans stationed at many junctions on the way to lighthouse. We had reached Bhatkal on a day after the local protests against a suspected terrorist arrest. Fortunately the city remained peaceful until we were there. The lighthouse is situated on an elevated hill. There is a small temple adjacent to the lighthouse. A good view of the sea and surrounding areas can be obtained from the top of the lighthouse. We could see the Hog island here. The next stretch of beach towards Kundapur is also visible clearly and we even started making plans about how to approach our next beach trek. We witnessed the sunset from near the lighthouse. After an unexpected dinner at Naren’s friend’s house in Bhatkal, we boarded the night bus back to Bangalore.